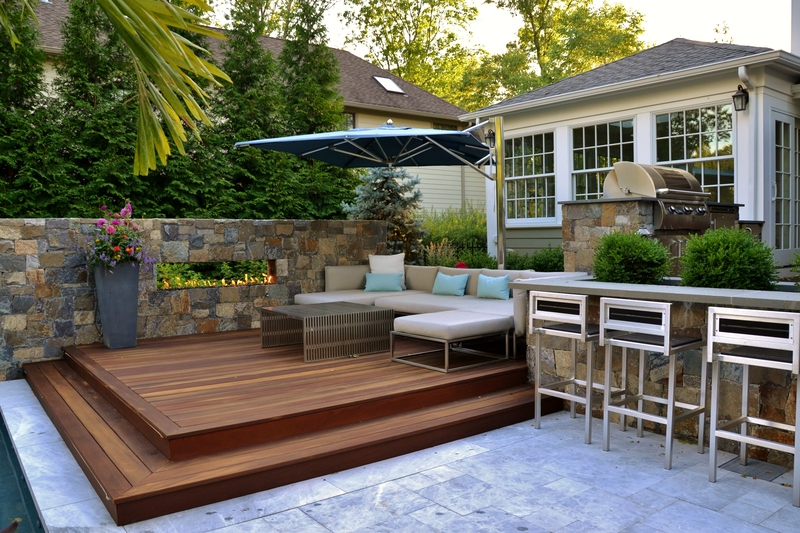 There are many variables considered while designing the ideal outdoor living environment for your home. Everything starts with the space provided, and working with the existing landscape and architecture of the time. There are proper permits needed and many times towns will have certain regulations and allotments that need to be taken care of from the beginning. Once that is squared away, it is time to start thinking about what should be included to create the ideal outdoor living space. Consider your lifestyle and your family life, and how the space would best be utilized. Creating an ideal outdoor living space is essentially designing a brand new room for your home. The new room can be turned into a living room, a kitchen, dining area, entertainment area, or a garden space. It depends on each homeowner’s preference and needs to expand upon their home. If the most ideal outdoor living space is one that can be enjoyed year round, outdoor fire pits or fireplaces are a wise investment. The fire will provide warmth to the outdoor element that is great for summer night s’mores to winter evening bonfires. Outdoor fireplaces can be designed to incorporate a television fixed on top, bringing sporting events or movie nights with the family to the outdoors year round. Creating outdoor kitchens is a growing trend throughout the region. Outdoor kitchens today are easily customizable to fit into any space or any style. This addition to any backyard creates an ideal outdoor living space that friends and family can enjoy. It is the ultimate entertainment space, perfect for hosting parties or intimate dinners. Stainless steel appliances are a popular addition to create a sleek and modern look outdoors, as well as including bar space, trash space, shelving and countertops. Every kitchen is designed to best suit each individual needs and provide the ideal outdoor living space for functionality. Selecting the materials used and the surrounding landscape are also large components of the design process. The materials and landscape will help to tie the overall design and aesthetic together. Whatever it is you are looking to achieve in creating your ideal outdoor living space, working with an experienced designer or architect will help you to make the most of your space. Looking at photos of other jobs in the surrounding area can provide ideas and inspiration for your own backyard and help to start designing your very own ideal outdoor living area to enjoy for all the years to come.